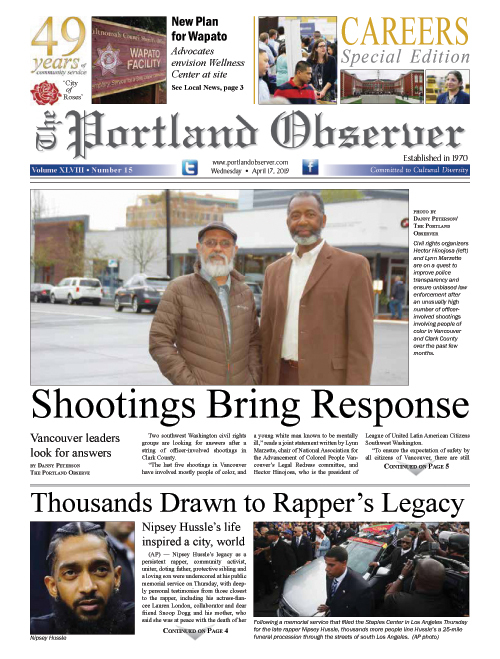 Danny Peterson | 4/10/2018, 5:31 p.m.
Celebrants and community members join Portland NAACP President and Pastor E.D. Modainé for the grand opening of a new office and headquarters in Lloyd Center. Located on the second floor near Marshall’s, it’s the first physical location for that the local civil rights organization in 30 years. The Portland NAACP is celebrating the opening of an office in Lloyd Center marking a milestone for increasing public outreach and building on the local civil rights group’s 104-year-old history. At 1,836 square feet, the new headquarters will help continue the legacy of the Portland chapter of the National Association of Colored People advocating on issues like fair housing, mass incarceration, poverty and education. A large group of dignitaries, elected officials and members of the black community joined together to mark the opening which occurred on the same day as Portland and the world remembered civil rights leader Martin Luther King Jr. on the 50th anniversary of his death. Charlotte Rutherford, the daughter of former Portland NAACP leaders Verdell and Otto Rutherford were among those in attendance. The Rutherfords were integral to passing the Public Accommodations Act in Oregon, a civil rights bill that became law in 1953. The Rutherford family home in north Portland once served as a NAACP office more than 30 years ago. “They would be pleased to see not only a building with a space, but as much space, and an easily accessible place that you've gotten today. I'm so glad that it's not in somebody's dining room like it was throughout my childhood," Rutherford remarked. Modainé took over as president of the Portland NAACP a month ago when former President Jo Ann Hardesty stepped down to run for Portland City Council. As the former vice president of the organization, Modainé had been searching for a physical office for the group when Lloyd Center General Manager Bob Dye offered a space in the shopping center on the second floor, next to Marshall’s. A pastor at Celebration Tabernacle Church and restaurateur of Po Shines Café, both centered in the historic Kenton district in north Portland, Modainé has been committed to community service for the past three decades in Portland, feeding the homeless and building community. Originally from St. Louis, Mo., the pastor said he’s humbled to represent a civil rights organization he views as an integral part of African Americans’ fight for equality, justice and having a voice. Among Modainé’s aspirations for leading the organization are to strengthen community ties, including those from African American clergy; to garner support for African Americans who’ve been displaced in housing by gentrification; to tackle the systemic racism that impacts people of color; and to increase efforts in the black community to increase voter registration, educational opportunities and advocacy. Modainé hopes the new location will also increase the organization’s presence in the black community and build branch membership.